Some 20 people crowded onto the San Rafael train station platform this morning, waiting for the 11:29 SMART train heading north towards Santa Rosa. But they were in for a disappointment–the first train wasn’t actually going to leave until 2:29 p.m. 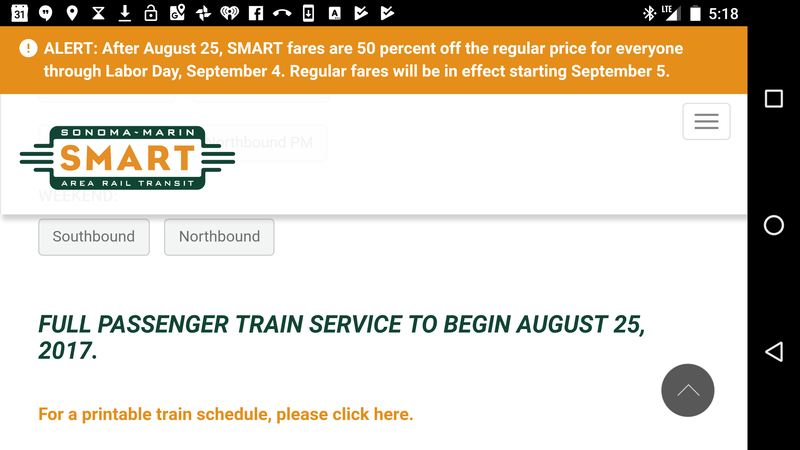 The platform was a chorus of groans and grumbles as word got around that “Full [emphasis added] train service begins Friday, August 25, 2017,” which the SMART train operators announced far and wide, wasn’t completely accurate. That SNAFU aside, after three hours the train finally came, “on time,” at 2:29. It was packed with lookie-loos. Eric Hanni, who was sitting comfortably at a table, said the train doesn’t go on her commute route, but she could see taking it on shopping trips. Lia Kastina, a retired Muni operator, said he never misses a train opening. “I rode BART on opening day in 1972.” Other riders seemed pleased with the train. The ride was smooth. The seats were comfortable. And the trains boasted big windows and tables at every seat. Thanks to the miscommunication from SMART, I was only able to ride as far as Petaluma (about 30 minutes) before taking a quick bike tour of its downtown and circling back for a return train. On the way back, the train was not crowded at all, and I was able to sit comfortably and enjoy a beer at the bar car. My impressions: It’s a great system that will be even better when the Larkspur extension is finished sometime in 2019, so people can continue on to downtown San Francisco by ferry. SMART uses self-propelled cars/Diesel Multiple Units, which are a promising technology for more sparsely populated areas because they are more fuel efficient (when demand for seats is moderate) than locomotive-hauled trains. They’re widely used in Europe and Asia so this is off-the-shelf tech that no transit agency should shy away from trying out. And the trains have great and ample bike racks! There are hooks in each car and places to lean and strap bikes in the bar car. If the bike rack isn’t needed, a seat flips down for extra seating space. Communications: terrible. It wasn’t just the miscommunication about the start of regular service. There are no departure boards at San Rafael station. The transit center information booth on the other side of 3rd Street is nearly impossible to find from the train station. SMART workers gave conflicting information–some said the system would now be on the schedule, others said it would not. And the historic train station, now a senior center, is doubly confusing because even I tried to enter the station through it–SMART or the City of San Rafael needs to find another location for the senior center, acquire the old building and put it back to its original use. Pedestrian treatments around the San Rafael station are pretty bad. Everywhere I went, beg buttons, fences, “don’t cross here” barriers. The train station is all but openly hostile to pedestrians. They need to work on that. The Petaluma Station is better, but it’s not obvious to a new comer how to get to downtown. The area immediately around the station is pretty desolate. I’d imagine future developments will make it more inviting. But all in all, the SMART train is a great addition to the Bay Area’s transit network. For fare structure and more info, check out the SMART web page. Thanks for the coverage! After a multi-decade absence, the North Bay finally again has passenger rail service. What wonderful news. I hope you got to expense that beverage stability test in compensation for hanging around Santa Rosa for hours! Not sure what miscommunication you’re talking about. SMART was pretty clear that the first train of the day would be the 12:49 departure from Santa Rosa Airport. Literally took about 5 seconds of reading to figure this out. Whistlestop has been at its location for as long as I’ve lived in the Bay Area. Don’t expect it to leave on account of an empty train line that happens to be next door. Looking forward to Streetsblog explaining away the poor ridership 6 months from now. Also, FWIW, the city and the three transit districts that serve San Rafael are working on siting a new transit center. So much for advanced coordination, eh? Ah, the joys of mobile websites! Glad I read the regular website instead, as linked to by the SMART e-mail distributed a week or so ago. My friends and I took the first train out of San Rafael on Sunday 8/27 at 11.52. It is distressing that trains begin so late on weekends. The train was SRO from the start. Some cars do not have tables, I observed three different types of cars, cars with tables and bicycle areas, cars just with seats, and the beverage car. Some trains will be two car, some three car. The train was again SRO returning from Santa Rosa. Uber, Waymo and others are in the process of developing driverless car technology, while transit systems in the Bay Area continue to rely on one operator in the front of every single train.